A voltage stabilizer is used for ensuring a steady level of voltage automatically for various electrical gadgets to prevent them from any kind of damage due to voltage fluctuations. These systems are predominantly used for regulating DC and AC voltages. The unprecedented rise in the consumption of power has led a significant demand for voltage stabilizer systems. The research report states that the global voltage stabilizer systems market is likely to be worth US$25.39 bn by the end of 2024 as compared to US$14.11 bn in 2015. Between the forecast period of 2016 and 2024, the global market is projected to expand at a CAGR of 6.66%. The growing demand for voltage stabilizer systems is attributable to the increasing adoption of building automation, especially in the developing regions, which face a major power crunch. Furthermore, the growing disposable incomes being spent on consumer electronics has also augmented the demand for voltage stabilizer systems. The report predicts that ongoing upgradation of transmission and power distribution networks in developed regions will also make significant difference to the escalating revenue of the global market. However, the market does face a few challenges such as the emerging trend of the green revolution. As consumers and governments are vying to bring down the carbon emissions, both the parties are expected to reduce the expenditure on electronics, thereby cutting down the need for voltage stabilizer systems. In terms of application, the global voltage stabilizer systems market is segmented into HVAC, building automation, industries (other than power), communication systems, power transmission and distribution, and consumer electronics. Of these, building automation leads the pack due to the growing demand for automation and centralized access in developed regions. Furthermore, the increasing demand for HVAC systems, centralized heating, ventilation, and air-conditioning has also boosted the demand for voltage stabilizer systems. The demand for centralized security access due to growing concerns pertaining to safety have also propelled the overall market. Lastly, the increasing uptake of these systems in emerging industrial areas, where fluctuations in power are frequent are also expected to drive the demand for voltage stabilizer systems market. On the basis of geography, the global voltage stabilizer system market is segmented into North America, Europe, Asia-Pacific, Latin America, and the Middle East and Africa. 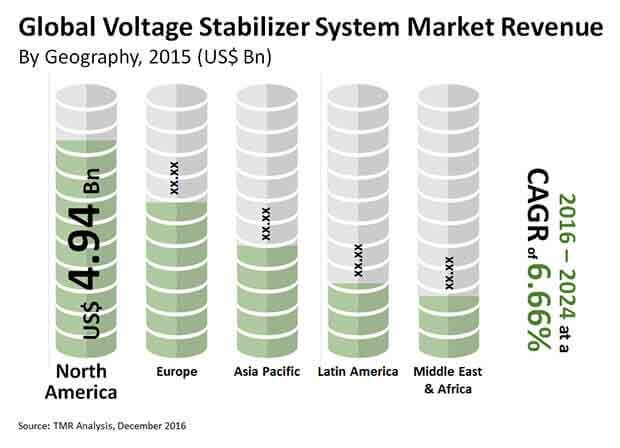 Of these regions, the North America voltage stabilizer systems market is expected to grow at a phenomenal pace due to extensive usage in building automation in the region. Europe and Asia-Pacific are expected to follow suit in the coming years. Asia Pacific is expected to offer lucrative opportunities to the overall market as the region is adopting voltage stabilizer systems with the expansion of power distribution and transmission networks. As the developing countries are looking at connecting cities and villages with power transmission and distribution systems, the demand is slated to show a continuous rise. The key players operating in the global voltage stabilizer systems market are Siemens AG, Voltas Limited, V-Guard Industries Ltd, Kon?ar Group, and Reinhausen Group among many others. The competitive landscape of the global market is quite fragmented due to the presence of several players. These companies are expected to focus on research and development to launch improved products that deliver efficiency. Voltage Stabilizer System is an electrical appliance that is used to feed voltage constantly to various electrical devices like computers, ACs, refrigerators and prevent those gadgets from fluctuating voltage. Voltage stabilizer systems work on the principle of transformers. In this system, the input current of the system is connected to primary windings and the output is received through secondary windings. Electromagnetic relays are activated when there is a drop in incoming voltage and that adds to the more number of turns in the secondary winding. This provides higher voltage compensate for the drop or loss in the voltage output. The reverse process happens when there is a rise in incoming voltage. Thus, the output voltage stays almost unchanged. One of the major driving force for Voltage Stabilizer System market is the growing percentage of people opting for building automation and HVAC system. Voltage stabilizer systems are expected to be majorly used in building automation, HVAC systems, and communication system. Furthermore, power transmission and distribution system also employ voltage stabilizer systems on a very large scale. Also, the increased use of voltage stabilizer in industrial applications apart from power is also forecasted to mainly drive the global voltage stabilizer system market over the next few years to come. This stabilizer is constantly and increasingly incorporated in these segments and also its application in new segments are increasingly driving global demand for these stabilizers. Increasing usage of voltage stabilizer systems in building automation and heating, ventilation and air conditioning (HVAC) system is forecasted to increase the global market of voltage stabilizer over the forecast period of 2016-2024. These stabilizers are used to spontaneously keep the voltage level constant for the electrical equipment. Increasing industrialization and manufacturing industries require high amount of power and uninterrupted flow of power. These stabilizers help in a maintaining smooth transition of power. Thus saving electrical equipment from sudden shocks. These shocks otherwise can lead to damage in the machines and other equipment. Upgradation and replacement of old power systems in various countries are also driving the market. Voltage stabilizer system market is segmented on the basis of application and region. The segments are building automation, HVAC system, Industrial – Other than Power, Power Transmission and Distribution system, Communication Systems, Consumer Electronics and Others. On the basis of regional segmentation, Voltage Stabilizer System market is segmented into five regions such as North America, Europe, Asia Pacific, Middle East & Africa (MEA) and Latin America. Regionally, North America accounted for the largest market share in 2015 thereby leading the market. The region of Asia Pacific is forecasted to grow with the highest growth rate. In this report, voltage stabilizer system have been analyzed in a very detailed manner. Major players of this market have been incorporated into this report. Their financial details and strategic overview have been studied here. This strategic overview showcase agenda and development of these key players in this market segment. With it, competitive outlook of these key players have been studied as well. SWOT analysis of key players have also been incorporated in this report. Further, major attractiveness of this market on the basis of end users have been analyzed. This attractiveness analysis shows the most attractive segment of this market according to present market size and CAGR (compound annual growth rate). In this report, global Voltage Stabilizer System market have been analyzed on the basis of revenue and the projection period runs from 2016 to 2024. Some of the major players operating in Voltage Stabilizer System market are Siemens AG (Germany), Voltas Ltd. (India. ), V-Guard Industries Ltd (India), Kon?ar Group (Croatia), Reinhausen Group (Germany) among many others.